This pattern is for the rainbow colored bracelet which is one of my soft bangles. The other bracelet is a wrap bracelet and you can find the pattern for that here. steel crochet hook- I used a Boye size 7, which is 1.65 mm. If you are using a Susan Bates hook, a size 6 would be a close equivalent. This is done in chains and single crochets, which means it works up very fast and easily except for the slightly tricky closing of the base. Chain 9, single crochet in first chain. Chain 6, skip single crochet and next chain, single crochet in the next chain. Repeat pattern, going back and forth until the bracelet is the right length to fit over your hand, ending with a loop on the opposite side as your starting chain 9 loop. The diagram is in 2 colors and each stitch set begins with the chain 6 and ends with the single crochet. Chain 4, and single crochet into the 3rd chain from the starting chain. chain 1, and turn to do the last single crochet skipping the single crochet and the chain before it and working in the next single crochet, chain 4, slip stitch to the starting chain/single crochet to join. The outer edge is worked by doing 4 single crochet in each loop, then breaking off the thread to work the single crochets on the other side. This can be blocked and stiffened into a standard bangle bracelet as well. If you plan to do that, find a bangle you like the fit of, and measure the diameter. Multiply that by 3.14 and make your starting chain that length. To block, I'd wrap a bottle or can with a piece of cardboard and cover with plastic, then use a permanent blocking solution to block. The bracelets above were both made with Aunt Lydia's cotton. 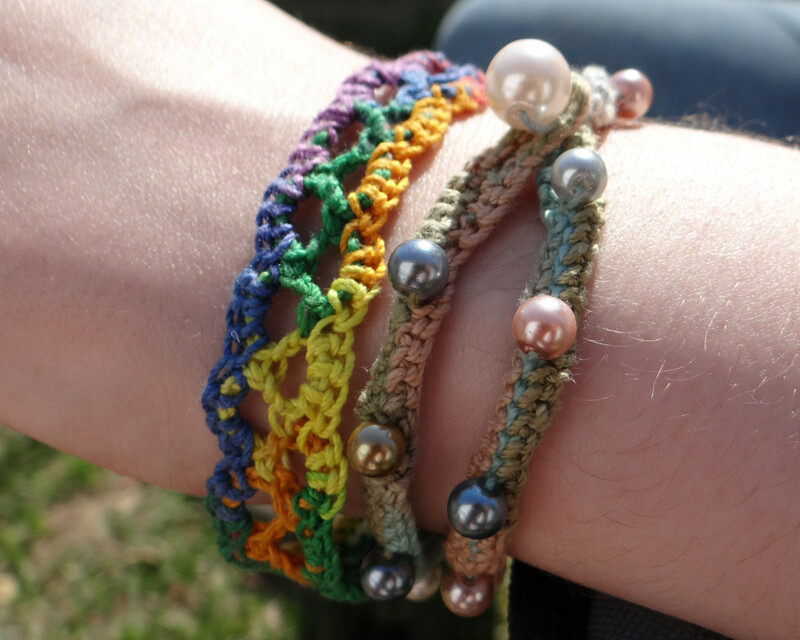 The pearl bracelet is in Aspen, and the bangle bracelet is in Mexicana.